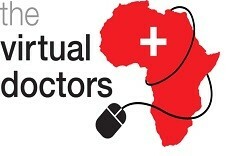 Trustees and supporters of the Virtual Doctors were joined at Lancing College on 20 September to hear about the work of the charity, which is already delivering a ground-breaking telemedicine service to rural health centres in Zambia and which is about to be launched in Malawi. 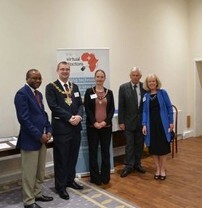 Those attending included the guest of honour, the Deputy High Commissioner of Malawi, the Mayor and Mayoress of Worthing, (Mr and Mrs Harman), and Cllr. Peter Metcalfe, the Chair of Adur District Council, as well as other politicians, medical and business professionals. The event was held by courtesy of staff and pupils of Lancing College and a number of the school’s Medical Group students were present on the evening, as well as representatives from local Rotary clubs. The audience were given insights into the work of this small charity who have local offices nearby. Huw Jones, the founder of the charity, held the audience spellbound as he shared his emotive story of what inspired him to want to help those in rural Zambia. He recounted how, several years ago, he came across a desperate man trying to cycle with his heavily pregnant and haemorrhaging wife to a hospital along a dirt road, 60 kilometres distant. After his inadequate attempts to help and his utter sense of helplessness when she passed away in his vehicle en route, he decided that he needed to do something. But what? After talking to doctors in other countries he realised that there were a lot of people who had the professional ability and also wanted to help, but they were too far away. The solution was obvious–telemedicine! During the event the presenters gave insight into the bespoke software app designed on a pro bono basis by a volunteer team at Landmark Information Group that has literally taken this telemedicine service to a new level. The app has been designed to transform the way rural health centres in Zambia access vital advice, diagnosis and treatment support from a pool of qualified volunteer doctors in the UK, by harnessing the power of mobile phone technology, in order to deliver vital patient care to patients located in isolated communities. A number of Rotarians were present, including James Phiri, from the Cranleigh Rotary Club (see photo). The charity was also presented with a cheque by the Rotary Club of Worthing. If you would like to find out more about the work of the Virtual Doctors and how you can help by getting involved or by making a badly needed donation then please contact enquiries@virtualdoctors.org or call Lina on 01273 454755.